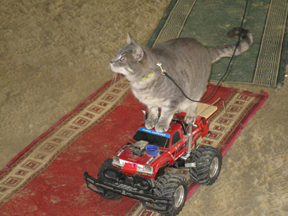 Dalton the cat on his truck! Dalton the cat was here today rehearsing for the Fundraiser October 28. He’s sevenish years old and hasn’t been on his truck for quite a few years. He’s not the svelte sweetie he once was. A plywood extension was added for his hind feet a few days ago and before the Fundraiser there will be some counter-weights attached to the front of the vehicle. The blue circle on the hood of the truck is where Dalton’s treats are placed. Dalton and his brother were kittens when they were found in a plastic bag, discarded along the road. Dalton landed on his feet and has found a career as a farm guard and movie star, including shows such as Darcy’s Wildlife, as spokescat for Whiskers, an Ikea ad, Warehouse 13, Covert Affairs and Hemlock Grove, to name a few.